Hello, fellow TRASHed ones! I just wanted to say that is was so nice having you all here, and I hope you enjoyed your visit to our state. Thank you all for your help during your time here...everyone pitched in so wonderfully with cooking, dishes, cleaning, etc. We've got a great family, and it's wonderful that we all get along so well. I hope you all had good journeys home, and that you'll come visit again soon! Eric found out the hard way today that the TRASH '08 water bottles should not be left in a hot vehicle. His is now quite warped and unusable. Just thought I'd warn y'all! Tommy Knocker Brew Pub is on the right. You can follow signs to town parking. From Idaho Springs to Snow Mountain Ranch. About 12 miles past Winter Park, the entrance to Snow Mountain Ranch is on the left. I am not sure what to do from here, because Tracy did not see fit to tell me when she ordered me to make these directions. Just keep driving until you see someone or something you know. If you never do find it... call Tracy's or Grammy's or Papa Lou's (anyone as long as it is not Shep's) cell phone. I cannot guarantee that anyone will answer because I do not know if we will have any kind of cell reception way up in the wilderness of Grand County. We have made it most of the way. Well we have made it to Colordado Springs. So far so good. Getting to hike back in some trails. 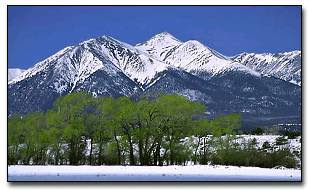 Going to Pikes Peak on Tuesday. We have plenty of down time. So if anyone needs us to pick anything we can. IE sunscreen, beer, or anything to save you from having to go to the store when you get here. Ted, I will stop at the Goodwill store to buy some clothes so we can rent bikes and show our our appearance. Thanks to all of you for calling Dad today on Father's Day. You made his day extra special. We are looking forward to seeing all of you very soon! I looked at the extended forecast for Winter Park and the highs are in the mid 60's, so pack accordingly. Don't forget............Talent Show................ parents as well as kids should participate........remember the fun we had when you were all kids!!!! Good memories! We love you all and want everyone to have a very safe trip!!! Swimsuit: two words: Banana Hammock! We have reservations for 12.5 people to horseback ride! (The .5 is Connor who will be riding with me or Eric). The reservation is for Monday, June 23 at 10:00am, for a 1-hour ride. The others counted in the 12 are: Greg, Kara, Megan, Andrew, Katy, Michele, Jake, Jenny, Maya, Eric, Tracy and Tyler. If anyone else wants to go, just let me know and I'll add you to the list. I didn't have to put down a deposit. Yeeeeehaw! Comfortable shoes -- you don't need hiking shoes to go hiking, but you won't want 3 inch heels! Might want to bring an extra pair in case they get muddy or wet. Backpack -- to take hiking, etc. And of course, a CAMERA!! We'll bring some bug spray so you don't have to deal with that on the plane. I'll let you know if I think of anything else. I found out from Winter Park that the nearest whitewater rafting they recommend is Mad Aventures. They have two places to go rafting -- Idaho Springs and Kremmling. Idaho Springs is on the way to Winter Park from Denver, and is actually closer to Denver than to Winter Park. I was thinking if anyone wanted to do this, it would be good to do it the day we head up or the day we head back from Winter Park. But it's Class III-IV rapids, so kids have to be at least age 13. I'm guessing this leaves us out, unless there's a group of adults that wants to go. Kremmling has Class I-III rapids, so kids age 4 and up can raft. However, Kremmling is about an hour drive from Winter Park. Not sure if anyone wants to make that trek. I'll assume we'll pass on the whitewater rafting, unless I hear otherwise from some of you. Feel free to come back and visit us any time when you might have more time to raft!